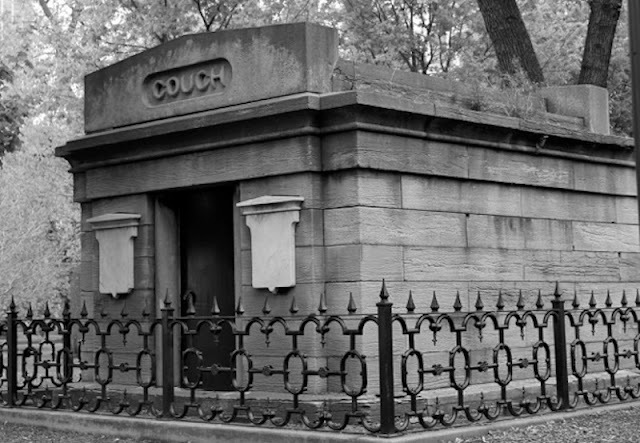 The Digital Research Library of Illinois History Journal™: Cemetery History of Early Chicago. Early burying grounds (prior to 1835) in Chicago were located at Fort Dearborn and along the river. The Fort Dearborn Cemetery (Circa 1805-1835) known as the "Common Burial Ground at Fort Dearborn and Garrison Cemetery" can well be considered Chicago’s first cemetery. Very little physical description of Fort Cemetery is known, but we know the site was not much more than sand, which shifted with the winds off Lake Michigan. It was difficult if not impossible to maintain the graves against the elements. Markers at best were probably simple wooden boards or crosses. Many other graves probably went unmarked. Cutting through of the sandbar for the harbor caused the lake to encroach and wash away the earth, exposing coffins and their contents, which were afterwards cared for and reinterred by the civil authorities. Located southeast of Fort Dearborn, the Common Burial Grounds at Fort Dearborn was located between the road leading to the fort and the west bank of the Chicago River as it flowed southward to the lake. It was before the channel was cut. According to modern street grids, the cemetery would have been south and east of the intersection of Lake Street (200 north) and Wabash Avenue (50 east). It was located on what today would be the south end of the Michigan Avenue bridge at the Chicago River (Approx. 300 N. Michigan by today’s street numbering system). Although there might have been an earlier burial, the first grave at the fort other than Indian burials is that of Eliza Dodemead Jouett in 1805, wife of Charles Jouett (1772-1834), the first Indian agent and government factor at Chicago. Her grave was placed at the entrance to the garden of the fort. Eliza of Detroit married Charles on January 22, 1803 and had one daughter. After Eliza’s death, Charles remarried in 1809 and had one son and three daughters by his second wife. On modern day street grids, Eliza’s grave would be in the middle of South Water Street (Wacker Place – 300 north) between Wabash Avenue (50 east) and Michigan Avenue (100 east). 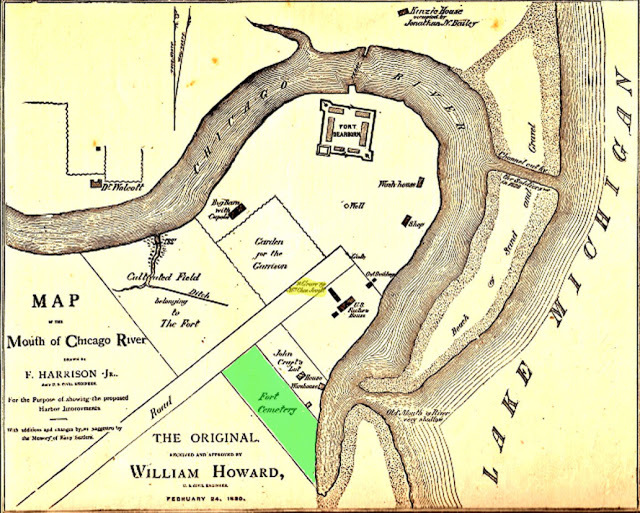 Although the special significance of her grave, by its location and identification on the Harrison map (marked in yellow), is not well explained, her death probably occurred before the formal beginning of the cemetery at the fort. 1830 map drawn by F. Harrison Jr. U.S. Civil Engineer and approved by William Howard, U.S. Civil Engineer. The Fort Dearborn Cemetery is highlighted in green. 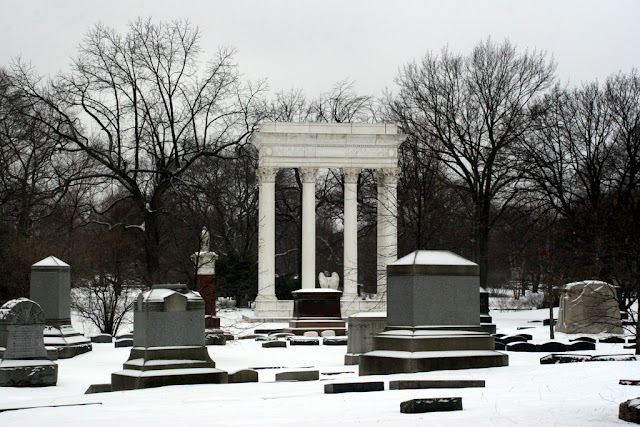 The documented history of this cemetery can best be established when Captain Hezikiah Bradley was sent to Chicago to re‑establish Fort Dearborn after the Massacre of 1812. He returned to Chicago on July 4, 1816 and found the victims of the massacre lying unburied in and around the fort. Historical accounts state that his first task was to carefully gather the bones and bury them in what would be later called the Fort Dearborn Cemetery. The Fort Dearborn cemetery probably closed in 1835 when two regular cemeteries were established near Lake Michigan, at the edges of town. One was located at Chicago Avenue and the other at Twelfth Street. 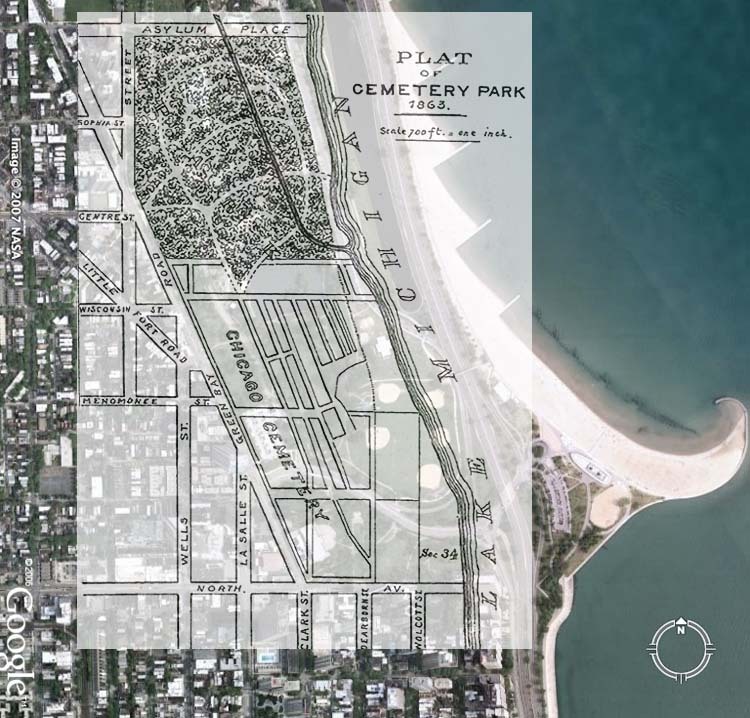 In 1843, a cemetery complex began on the Green Bay Beach Ridge (now North Clark Street) at North Avenue and slowly extended north with the 60-acre City Cemetery and south with the smaller Catholic Cemetery. A Jewish Burial Society bought six-sevenths of an acre in City Cemetery in 1846. Four years later, the city added 12 acres to its cemetery by purchasing the adjacent estate of Jacob Milleman, a victim of cholera. Built in 1858 for Ira Couch, costing of $7,000, at the south end of Lincoln Park. The other above-ground tombs were removed and all other bodies were re-interred shortly after the cemetery was closed in the 1869. Citing the proximity of the burial grounds to the city's water supply as hazardous to public health, Chicago's sanitary superintendent, physician John Rauch, requested the abandonment of the city cemetery as early as 1858. 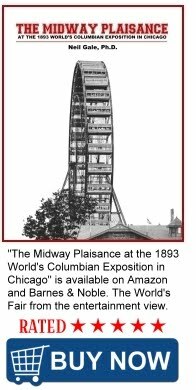 Burials, however, continued until 1866, when Chicago lost a lawsuit filed by the Milleman heirs, who claimed $75,000 was owed to them as a result of the mistake-ridden sale of 1850. The city chose to move the bodies to private cemeteries located outside of the city limits and return the land to the heirs. The Great Removal began. 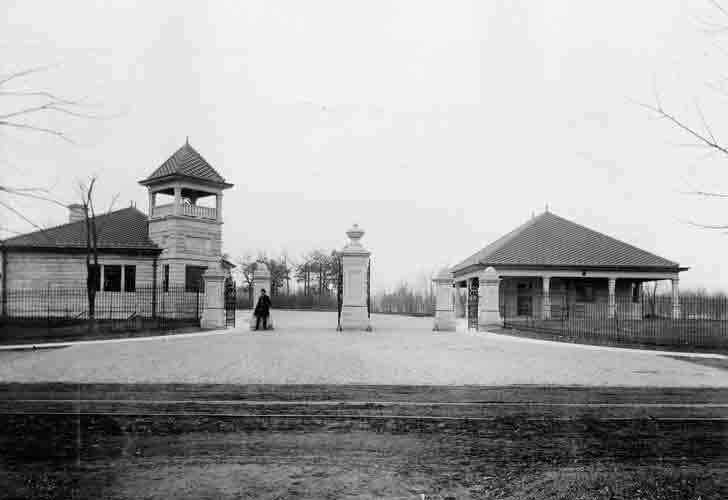 City Cemetery bodies were wagoned to Graceland, Oakwoods, Rosehill, and Wunder's cemeteries. The Roman Catholic choices were Calvary in Evanston and St. Boniface in Chicago. Jews had moved their burial ground to Belmont and Clark in 1856. 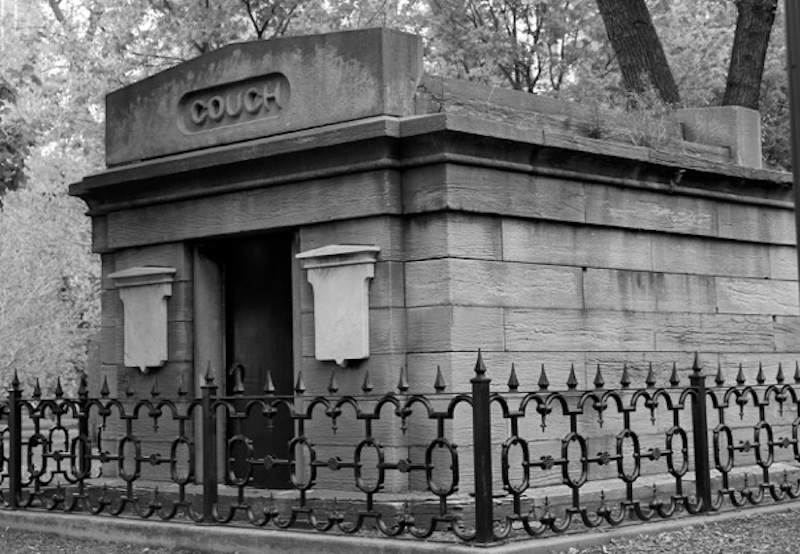 Chicago city government attempted to prohibit any new burials within the city throughout the late nineteenth century. Yet, as the city annexed additional land, it found itself contending with existing cemeteries inside its limits. Graceland, for instance, was situated two miles north of the city until the great annexation of 1889. The state of Illinois protected these private cemeteries from city bans on burials. Still, Chicago was able to exercise some control over their extension by passing an ordinance in 1931 that made it unlawful for cemeteries to expand or change their boundaries without a special permit. " An account of the laying out, by the town authorities of Chicago, in 1835, of two cemeteries one on the North side and one on the Southside. The North side cemetery was used as the Protestants, while the Southside cemetery became the first Catholic burying ground in the city. No interments were made in the South side grounds after 1842. 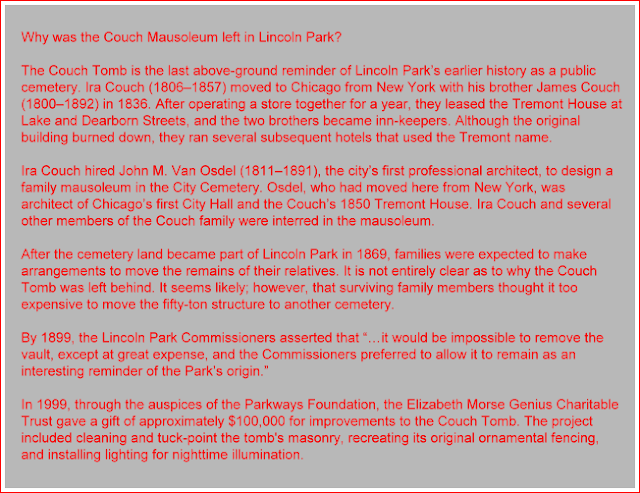 About 1847, the city authorities re-interred the bodies from the bural grounds in the Lincoln Park tract, known as Chicago Cemetery. The Chicago Cemetery tract contained altogether three thousand one hundred and thirty six burial lots, and was designated under the old survey, as the "Milliman" tract. By a decision of the Illinois Supreme Court, the city lost the title to the Milliman tract and the Common Counsel, in 1865, ordered the vacation of the tract, authorizing lot owners to exchange their lots for lots in any of the new cemeteries, of equal size and of their own selection Graceland, Rosehill, and Oakwoods had, by this date been established. When the time allowed (two years) the city to vacate the tract, had expired, a special committee, appointed by the Common Counsil, consisting of Aldermen Woodard, Wicker, and Lawson, made the selection for about two hundred lot-owners who had not made any selection and could not be found. The committee selected lots, of equal size and in the best obtainable location, in that part of Oakwoods known as the "Third Division, Section B" where the bodies were re-interred in precisely the same order as they had been in the Chicago Cemetery. The city holds the title to the whole tract purchased in Oakwoods, and any of the owners of the so exchanged were given the privilege of obtaining a deed to the new lot upon execution of a release of the old one. After several years of litigation, the portion of the old Chicago Cemetery included in the present limits of Lincoln Park passed under the control of the park commissioners. Joseph H. Ernst, of No. 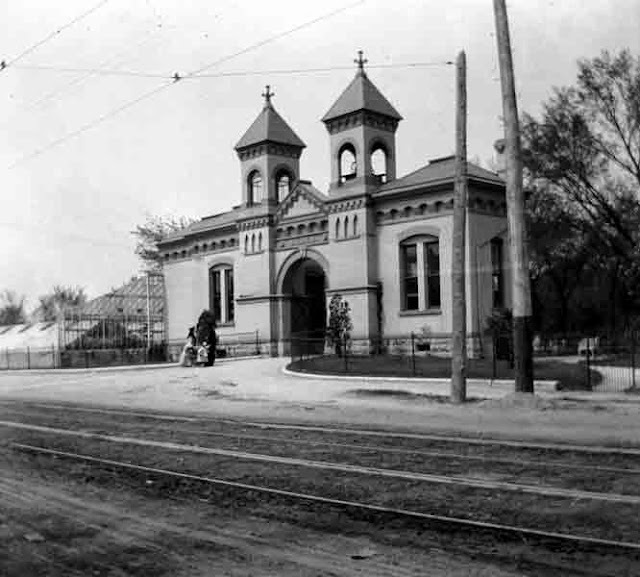 271 North Avenue, was the sexton of the Chicago Cemetery for a number of years and had charge of the exhumation of the bodies. The Jewish Congregations had a cemetery five miles north of the city, on the Green Bay Road (now North Clark Street). They formerly had a plat of ground in the Chicago Cemetery. The Hebrew Benevolent Society established a burial-ground here in 1855. The grounds are high and overlook the lake, and contain a number of fine monuments. Sinai and Zion congregations also had an extensive plat reserved at Rosehill. Rosehill Cemetery Company was chartered February 11, 1859. Wunder's Cemetery was a German cemetery was laid out, near Waldheim, in 1859, at which time it consisted of four and a half acres. It was called "Wunder's" Cemetery, in honor of Henry Wunder, a noted German Lutheran divine. In 1866 it was increased to fourteen and a half acres. There were no burials after 1872. Graceland Cemetery was founded in 1861, by Thomas B. Bryan, who purchased eighty acres of land, five and a half miles from the center of the city, on rising ridges near the lake shore. Oakwoods Cemetery lies three and a half miles due south of the city limits. It is reached by the boulevard drives through the North Park, and Illinois Central Hyde Park trains stop at 67th Street, from whence a broad walk leads to the cemetery entrances. The cemetery was laid out in 1864. Forest Home Cemetery lies on the banks of the Desplaines River, four and a half miles west of Chicago, on Madison Street and was founded in 1876. Waldheim Cemetery is directly opposite Forest Home Cemetery, to the south, and lying between Harrison and Twelfth streets, on the Desplaines River. It is owned by a corporation re-organized in 1881 under the law of 1879. St. Boniface, a German Catholic Cemetery, consisting of about thirty acres, is located on the Green Bay Road, three and a half miles north of the city (now North Clark Street). Calvary Cemetery was the favorite burial place of the Irish Catholic Churches. It lies nine miles north of the city near Evanston. It was consecrated shortly after the opening of Graceland Cemetery in 1861, although prior to this some of the bodies taken from the consecrated ground in the old Chicago Cemetery were re-interred here. The early places, say up to the late 1840s, have been abandoned, and the deposits all removed to the newer grounds provided by the several cemetery associations of the city. By 1893 these were the cemeteries listed. Do you have any idea of where John Kinzie's daughter Elizabeth Kinzie Miller's body might be buried? I know she died of sickness at Fort Dearborn, had some children and was married to Samuel Miller. Sounds like it wasn't much of a burial ground. Elizabeth Kinzie Miller is listed as "Unknown Burial site." I went on a nature hike at Oak Forest Hospital,(159th & Cicero) and learned of the burial of thousands on the grounds. There's going to be another tour next month about it.Is there somewhere to research more? Another large burial site near Irving Park Road and Oak Park Avenue, where the Cook County Insane Asylum (aka 'Dunning' and later Chicago-Read Mental Health Center) was located. Construction still turns up unrecorded graves. Search the DRLOIH for details. A terrific post, Neil. Thank you. The information on Wunder’s Cemetery is incorrect. 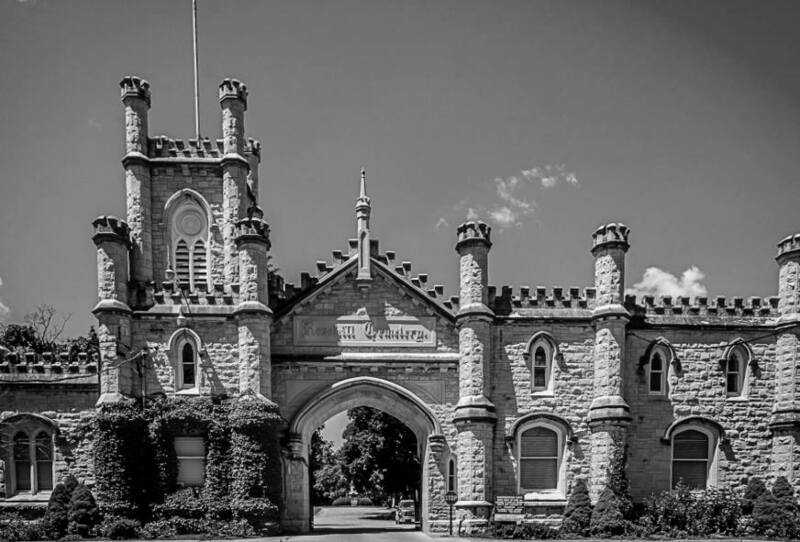 Wunder’s Cemetery was originally German Lutheran Cemetery, and is located directly south of Graceland Cemetery. The German cemetery near Forest Home Cemetery was organically called German Waldheim before it merged with Forest Home Cemetery in 1968. What do you know about O'Haney Emunah 'Jewish' Cemetery & O'Haney Shalom 'Jewish' Cemetery? How did two 'Jewish' cemeteries wind up with the same Irish name?